We offer a variety of information on resources in our county. Come find out what is available for you and your family. What’s New at the Active Adult Center? Movie Day starting in May! Sponsored by Buena Home Care. Come show your moves to “Dancercise” with Lola (low impact) Come Rock on over! Easy to follow classes, helps improve overall health Monday-Wednesday-Friday-10 a.m. to 10:45 a.m.
Wii bowling Tuesday’s and Thursdays 8:30 a.m. to 1:30 p.m. If you’re interested in taking photography to another level. To Buena Vista Palliative Care & home Health, and Gold Coast, and Bankers life. May 24th Bankers life presentation! Please Call the Active Adult Center (805)524-3030 if you’re interested in neutering your pet. Presentation on the 21st of May is cancelled until further notice. May 24th Bankers Life, Medicare - come enter a chance to win raffle: great prize. For sight has brought by a box to Donate usable eyeglasses. 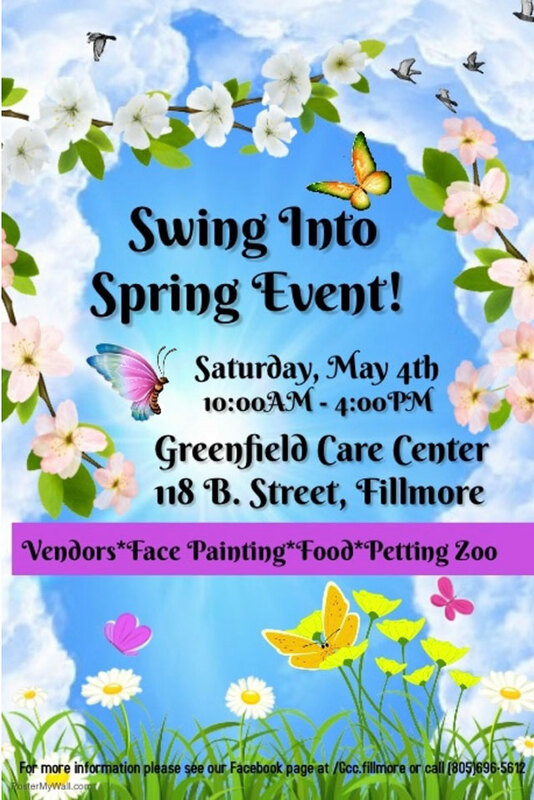 Please read your local Fillmore Gazette, more fun and exciting events and Activities to come. Open Monday – Friday: 8:30 to 1:00 PM. Monday - 8:00-9:00 Senior Walk / 9:00-10:00 Tai Chi Class / 10:30 Senior Chair Exercise. there is parking in the back of the building, parking in front is limited to 2 hrs before before 6PM. application. The only requirement is you must be 55 & live within the Fillmore Unified School District. Fireworks is coming up I know this is early but July will be here before you know it. We need volunteers to work in our booth. Age 18 and over are welcome to sell in the booth. This is our annual fundraiser and we will need help selling fireworks. If you are not available, maybe someone in your family would love to volunteer their time. Please contact the Fillmore Senior Center, located at 330 Central Ave. Our phone # is 524-4533 call and sign up. Interested in taking a Yoga Class, Whether you are new to yoga or just want to practice we offer a relaxed and refreshing experience. This would be an excellent class in stress reduction, strength, flexibility and self-healing. Please call us and let us know which day is good for you and the time. Our phone # is 524-4533. Sketching and Watercolor Class taught by Virginia Neuman, This class is on Thursday Mornings at 10:15 AM. Here at the Fillmore Senior Center. Located at 330 Central, Suite C. Virginia takes her students through the basics of drawing and painting, including shading, perspective, composition and color theory, while teaching skills of observation. Remember new things are happening each Month. May 10th, 11:00 a.m. to 3:00 p.m. Mark your calendar come join us for Mother’s Day! Special luncheon & Dance. What a special day. Make that day even more special by joining your mother, grandmother for a great lunch. We all need an excuse to celebrate. Why not celebrate with you’re a mom, and or grandma. You don’t need to be a mother or grandma to join. Come and eat some of our delicious food and enjoy the music and dance a little. The meal is made from scratch by our very own Senior Nutrition Coordinator Teresita Rocha, and volunteers. To Buena Vista Palliative Care & home Health, and Gold Coast. What a deal! 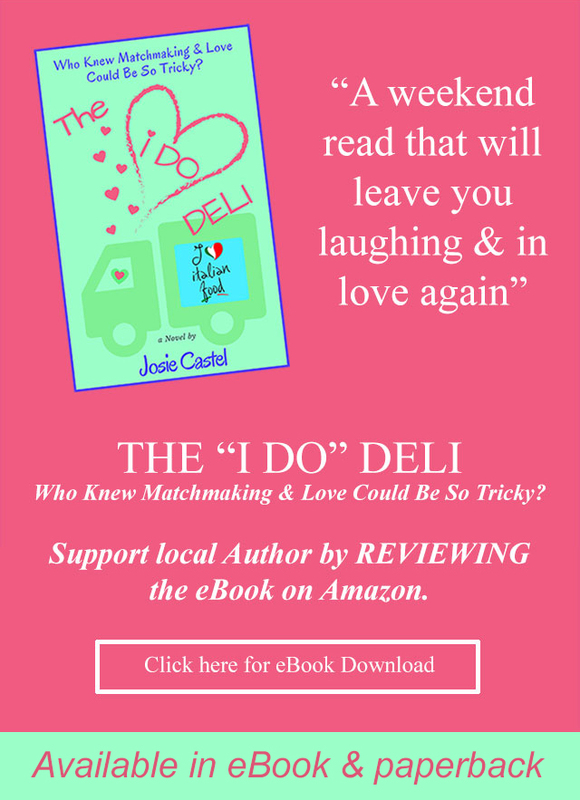 Only a $5.00 donation for 60 and over, caregivers, $7.00 and all others. May 11th Zuni Paws Heat/and Treat tips on how to keep your animals cool. Recommendation to help save members of our Pet family. If you come for presentation you are entered for the raffle on the 24th Come increase your chances to win on the 24th Bankers life presentation! there is parking in the back of the building, parking in front is limited to 2 hrs. What’s New at the Active Adult Center? Movie Day starting in May! Sponsored by Buena Home Care. BINGO! This routine. Monday thru Friday 8:30 to 9:30 let’s take a stroll outside and enjoy our city. May 10th, mark your calendar come join us for Mother’s Day! Special luncheon. What a special day. You don’t need to be a mother or grandma to join. Come and eat some of our delicious food. Made from scratch by our very own Senior Nutrition Coordinator Teresita Rocha, and volunteers. All Entrée include: green salad, enchiladas, rice and beans. Desert compliments of Greenfield Care Center of Fillmore. What a deal! Only a $3.00 donation for 60 and over, caregivers, $5.00 and all others. April 20th 211 guest speaker Amber Segovia call 211 for different wonderful resources in our community. April 21st Hi Capp What is Hi Capp? If you’re interested in finding out. Come join our presentation. Would love to see you. Wednesday Ball Room Dancing 10:00 a.m.
April 12th Zuni Paws Disaster for pets. What to prepare for in case of a Disaster, recommendation to help save members of our Pet family. April 21st Hi Capp What is Hi Capp? If you’re interested in finding out come join us. Wednesday - 9:00-10:30 Busy Hands (Knitting & Crocheting) / 10:30 Line Dancing. Spanish Class on Thursday’s this year. @ 9:00 AM. Carmen Zermano will be teaching the Class. We are looking forward the having this class back and seeing all the students here again. Bring a note pad / pencil / pen to take notes. ACTIVE ADULT CENTER IS PLANNING A TRIP. YAHOO! IF YOUR INTERESTED IN A TRIP TO CHUMASH CASINO? SIGN UP TODAY! 533 SANTA CLARA STREET, FILLMORE April 8TH, 2016 - depart at 9:00 a.m. – leave casino at 4:00 p.m. - arrive back in Fillmore at 6:00 – 6:30 p.m. PAY ONLY $22.00 DOLLARS, and RECEIVE $30.00 FREE PLAY. WHAT A DEAL. WHERE CAN YOU PAY $22.00 DOLLARS? AND GET $30.00 BACK? CHUMASH CASINO!! PLEASE BRING GRATUITY $2.00 FOR BUS DRIVER. IF YOU WILL BE NEEDING WHEEL CHAIR ACCESS, PLEASE MAKE ARRANGEMENTS AT LEAST A WEEK IN ADVANCE. Amazing! The wager just went up from $25.00 free play, to $30.00 free play compliments of Road Runner and Chumash Casino. sorry no credit accepted. And if that doesn’t entice you! 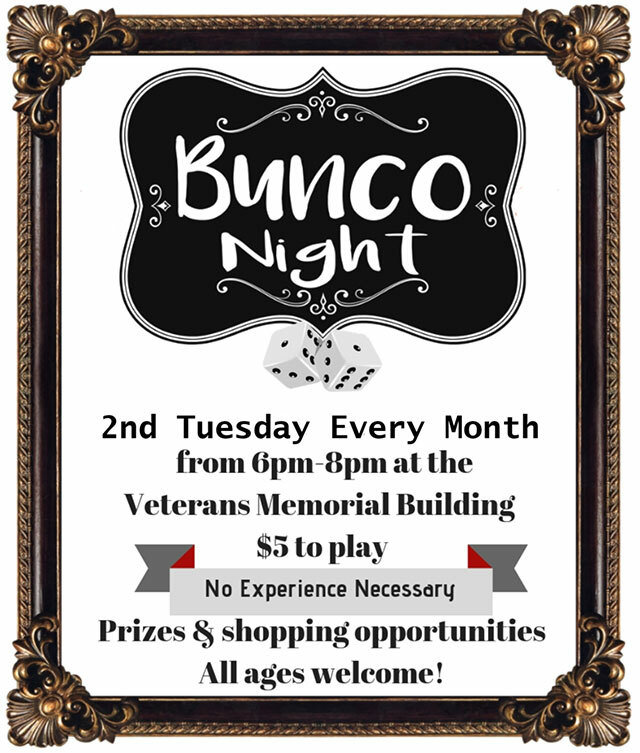 Maybe this will; First time players from Ventura County (Residence only) receive $50.00 extra (free play). That’s right you receive $50.00(free play) plus $30.00(free play) a total of $80.00 free play. 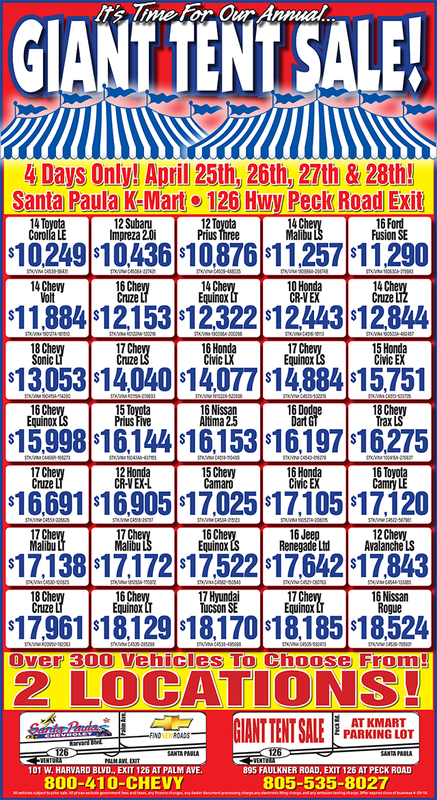 Shuttles available every hour from casino to Solvang free of charge. IF YOU HAVE ANY QUESTION PLEASE CALL (805)524-3030 NEED TO BE 21 and older. Don’t forget you will be needing a California picture ID, call for details. in joining this Class please call 524-4533 it’s important not to miss any of the Classes. We are interested in Starting a Yoga Class, the class would be taught by Lisa Hammond. Whether you are new to yoga or just want to practice we offer a relaxed and refreshing experience. This would be an excellent class in stress reduction, strength, flexibility and self-healing. Please call us and let us know which day is good for you and the time. Our phone # is 524-4533. Spanish Class on Thursday’s this year. @ 9:00 AM. Carmen Zermano will be teaching the Class. We are glad to have the class back and seeing all the students here again. Bring a note pad / pencil / pen to take notes. Book Club is reading “Astoria” by Peter Stark. The Book Club usually meets on the 2nd Tuesday of the month, but this time is meeting Tuesday March 15th. at 10:00 at the “Little shop of Hoarders” on Central Avenue. 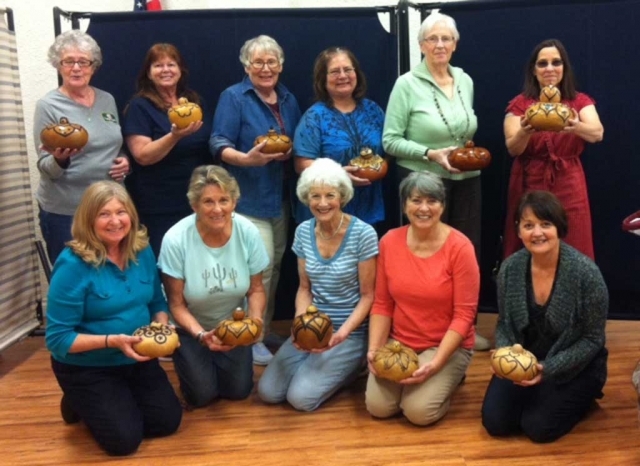 Then next month will be back at the Fillmore Senior Center, located at 330 Central Ave. Suite C.
Fillmore Senior Center Gourd Class shows off the Gourds they have been working on. This is an advanced Class Taught by Charlene Smith on the first & third Tuesdays' of the month. Class members are: Donna Voelker, Diana Hoslett, Shelley Johnson, Colleen Kyffin, Kathleen Johnston, Chris Garcia, Debby Curnett, Jean Westling, Karen Bagley, Lola Rogers, Michele Smith, Nancy Bowlin. “Special Cards 4 Special People” has been rescheduled to Thursdays’, March 10th, 17th, 24th. & 31st. from 11:30 –1:00 the cost of the class is $5 per person, per Class. All supplies will be provided. Anyone 55 plus interested in joining this Class please call 524-4533 it’s important not to miss any of the Classes. A Drawing & Watercolor Class is being taught by Virginia Neuman, a graduate of Chelsea School of Art, London, England. This class is on Thursday Mornings at 10:15 AM. At the Fillmore Senior Center. Located at 330 Central, Suite C. Virginia takes her students through the basics of drawing and painting, including shading, perspective, composition and color theory, while teaching skills of observation. Her goal for her students is to be comfortable drawing and painting on their own, and to be happy with the results. This is a great opportunity to learn from one of our own Fillmore Artists, without having to travel 20 miles to a College. Book Club is reading “Astoria” by Peter Stark. We Meet 2nd Tuesday of the month, next time is March 8th. $3:00 Night classes offered Tuesday 4:30 p.m. / Friday 4:30- p.m.
Hmmm! Delicious Corn Beef and Cabbage, salad, bread, fruit, 11:00 a.m. to 1:00 p.m.
Easter Luncheon: Friday March 25th, Tuna Casserole, vegetables, salad, bread, fruit, dessert. Come listen to Nene Rey entertainment. Offering a variety of information on resources in our county. Hmmmm! Delicious Corn Beef and Cabbage, salad, bread, fruit, 11:00 a.m. to 1:00 p.m.
A Drawing & Watercolor Class is being taught by Virginia Neuman, a graduate of Chelsea School of Art, London, England. This class is on Thursday Mornings at 10:15 AM. (Unfortunately, not this Thursday) But the following Thursday Here at the Fillmore Senior Center. Located at 330 Central, Suite C. Virginia takes her students through the basics of drawing and painting, including shading, perspective, composition and color theory, while teaching skills of observation. Her goal for her students is to be comfortable drawing and painting on their own, and to be happy with the results. This is a great opportunity to learn from one of our own Fillmore Artists, without having to travel 20 miles to a College. come in and pick up an application, or e-mail us at fscinc@la.twcbc.com we will send you an application. The only requirement is you must be 55 & live within the Fillmore Unified School District. We are Starting 2 new classes: The 1st class: is a Yoga Class on Thursdays 11:30 taught by Lisa Hammond, Whether you are new to yoga or want to hone your practice we offer a relaxed and refreshing experience. This is an excellent class in stress reduction, strength, flexibility and self-healing. Extra yoga mats are available if needed. Please arrive at least 5 minutes early. Our 2nd. class: is Called “Special Cards 4 Special People” taught by Mary Turk. The first class is scheduled for Tuesday’s, March 15th, then 22nd. & 29th. from 11:30 –1:00 the cost of the class is $5 per person, per Class. All supplies will be provided. Anyone 55 plus interested in joining please call 524-4533 and tell us which class your interested in. A Drawing and Watercolor Class is being taught by Virginia Neuman, a graduate of Chelsea School of Art, London, England. This class is on Thursday Mornings at 10:15 AM. Here at the Fillmore Senior Center. Located at 330 Central, Suite C. Virginia takes her students through the basics of drawing and painting, including shading, perspective, composition and color theory, while teaching skills of observation. Her goal for her students is to be comfortable drawing and painting on their own, and to be happy with the results. This is a great opportunity to learn from one of our own Fillmore Artists, without having to travel 20 miles to a College. Book Club is reading “The Nightingale” by Kristin Hannah. This week only, the class will be on Friday, February 12th, @ 9:00 am meeting located at 330 Central Ave, Suite C. Across the street from the Post Office. Acrylics Water Color Class taught by Judy Suzuki . Dates to be determined. 22nd. & 29th. from 11:30 –1:00. Cost is $5 per person, per class. All supplies will be provided. You will design a beautiful card that you would be proud to send to any of your family or friends. note pad / pencil / pen to take notes. the beautiful view of Santa Clara Valley and Santa Paula Peak. The hike is 1.5 miles round trip. Bring a hat, sweater, sunglasses, sunscreen, water, and snack. Rain Cancels. Meet at 10:00 a.m.
at Toland Park or 9:30 a.m. at the Fillmore Senior Center, 330 Central Avenue, Suite C.
families with children (strollers OK). Bring hat, sweater, sunglasses, sunscreen, water, and snack. and live within the Fillmore Unified School District. 9th, 16th, 23rd 1:00 to 3:00 includes supplies, please bring your scissors. Permits let’s take a stroll outside and enjoy our city. Monday-Wednesday-Friday-10 a.m. to 10:45 a.m. If you’re interested in taking photography to another level. April 16th more information to follow. ACTIVE ADULT CENTER IS PLANNING A TRIP, YAHOO! IF YOUR INTERESTED IN A TRIP TO CHUMASH CASINO? SIGN UP TODAY 533 SANTA CLARA STREET FILLMORE February 8TH, 2016 DEPART - 9:00 - ARRIVE BETWEEN 6:00 – 6:30 P.M.
Live entertainment – boutique items for all occasions.